Bloody plots consume the Seven Kingdoms, as once-loyal bannermen turn against the kings that they had sworn to serve. A procession from Dorne marches north to King’s Landing, intent on exacting vengeance against the Lannisters. Robb Stark moves quickly to reclaim Winterfell, unaware of the dark plots being hatched in Harrenhal and The Twins. And on the continent of Essos, Daenerys Targaryen liberates the city of Astapor from the Good Masters and wins an army of Unsullied in the manner of Old Valyria—with fire and blood! The Fall of Astapor is the next Chapter Pack in the Blood and Gold cycle, continuing the saga of A Song of Ice and Fire into the third volume, A Storm of Swords. Within this pack, you’ll find more cards focusing on the new bestow keyword, powerful new economy, new ways to spend your gold, and the subtly growing influence of House Frey. 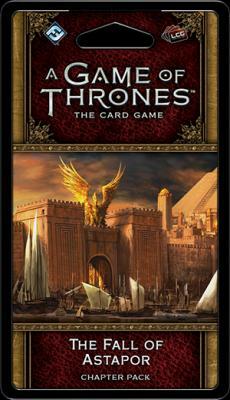 You’ll even have the chance to add iconic characters and locations to your deck, including Grey Worm, The Twins, and a new version of Theon Greyjoy.